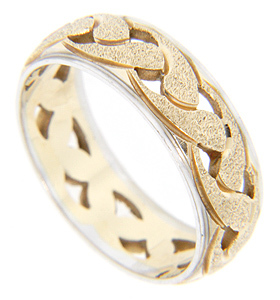 A braided design decorates the central strip of this two-tone 14K gold vintage wedding band. The braided section is crafted of yellow gold while slim white gold strips frame the edges. The wedding ring measures 6.3mm in width. Circa: 1950. Size: 7. Cannot be re-sized.